(1) The contribution of Lars Feld exemplifies why the EMU is and will remain dysfunctional. (2) I agree that the problem is that there is no political union in Europe, which would serve as a unifying force. But to think that will ever be achieved is pie-in-the-sky sort of thinking. (3) Without it, the distrust between the Member States – which economists dress up as “moral hazard” – is too deep. (4) The cultural differences, the histories, the languages and all the rest that underpin that distrust means that there can be no meaningful and functional reform that delivers sustained prosperity. (5) It is time to dissolve the disaster. “By way of background, there was a Op Ed earlier this week (July 31, 2018) – Claus Offe: Time is running out for EMU reform, as divide between winners and losers grows – which recorded an interview by Italian political scientist Maurizio Ferrara with retired German sociologist Claus Offe. “Germany thinks that if every Member State followed its example then they could become powerhouses. “On the same day as that interview was published (July 31, 2018), the UK Guardian published an Op Ed from German economist Hans-Werner Sinn – Is this the end of the road for the euro? – who thinks the “single currency experiment has gone from party mood to hangover”. 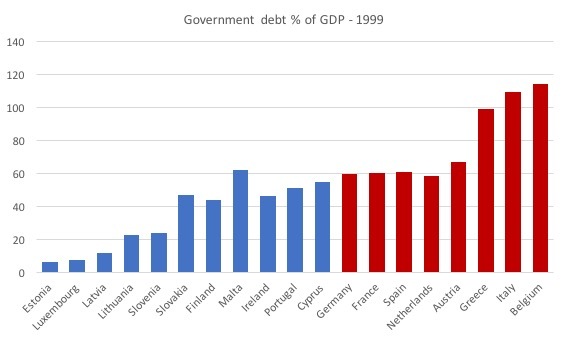 Amazingly, Sinn thinks that “Portugal, Spain and Greece are all governed by radical socialists who have abandoned the concept of fiscal responsibility, which they call ‘austerity policy’”. “But I thought it was the offering of a third German commentator this week (July 31, 2018) – Whither a fiscal capacity in EMU – by academic economist Lars Feld that was the most telling. “As I have written many times, the Eurozone has survived in its fraught form to date because the ECB has broken the laws and, effectively, funded fiscal deficits. Originally, EMU counted on member states’ individual fiscal space to cope with economic shocks by expansionary fiscal policy. Arguing that in the statu quo, some countries have accumulated excessive debt such that they are unable to provide fiscal impulses from national budgets reveals that the problem is insufficient consolidation of public finances in those states in the first place. It also indicates that the creation of a euro area fiscal capacity now would serve as a premium for countries with profligate fiscal policies in the past. “I agree with Feld that the convergence process was a farce. I documented that in detail in my 2015 book – Eurozone Dystopia: Groupthink and Denial on a Grand Scale. “Lars Feld exemplifies this distrust.